The only thing that wasn’t fun about the State Fair Parade event was parking far away. We had such a blast. The Timberwolves marching band and some of their dance team were behind us in the parade. They were so good! We wanted to dance on the float the whole time! 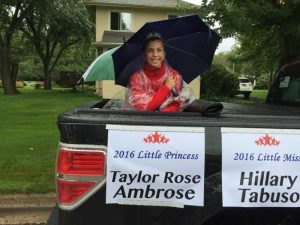 We got to share a giant State Fair float with other royalty from various cities and organizations, and it was pulled by a tractor which was really neat! The parade route was a big circle, so my mom and brother got to see me go by twice by taking a short cut across the parade route! This parade was neat because after the parade I knew exactly where I wanted to go for snacks! 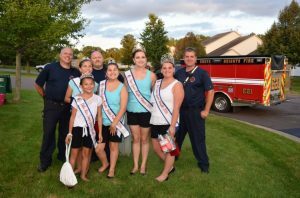 On Saturday, August 20th, Both Olivia’s and myself attended the pepperfest parade and spaghetti eating contest! It was nice to make some friends from our neighboring state and even meet up with other royalties from our surrounding cities. Our team, which included Olivia’s dad, Nick, finished in 4 minutes and 15 seconds! I ate my portion in a minute flat! 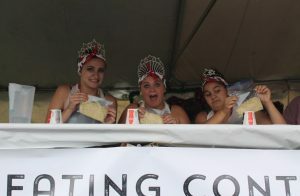 It was such an amazing experience and I hope to see the pepperfest girls again soon! 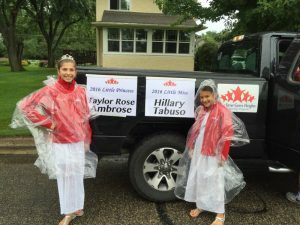 The St. Paul Park Heritage Days Grande Day Parade with my royal sister Hillary was so much fun, even with the rain. There were some great photo opportunities, like taking pictures with a fire truck. I had a great time waving to all the little girls and boys, including my little brother, and talking with the visiting royalty. We stayed covered from the rain, but Little Miss Hillary’s sign blew off the truck from the wind which was pretty funny. 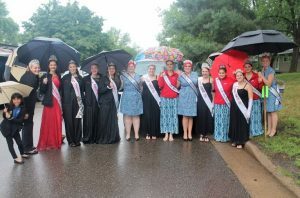 Overall, it was a great parade and the rain didn’t slow us down. On Wednesday August 10th, we had our kick off dinner. This is one of my favorite events, because not only do we get to see the candidates in action but we also make a dessert that gets auctioned off. 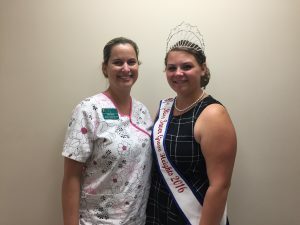 I was so fortunate to have my family and family friends there to support me along with my sponsor, Jessica from the Inver Grove Heights Animal Hospital. My royal girls and I had prepared speeches to thank each section of our program. Mine was the sponsors. Without sponsors and a dedicated board, the program would simply not exist. This event is also when we start our “has been” process. We are honored to get a pin from the past royal girls who crowned us (not all were able to attend). 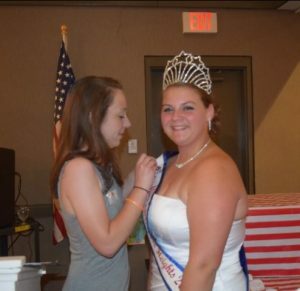 I was given the pin by Kelsey, Miss Inver Grove Heights 2014. It was truly an amazing night filled with laughs and sugar because of our colorful circus theme. August 7, my court and I went to a Special Olympics Luau. This was also a candidate event. We helped set up decorations to make the VFW more like a luau. Once everyone was there the court and candidates mingled and had fun dancing with them. We also painted nails and faces. We played musical chairs and I got 3rd place! We helped serve pizza and desserts. We had so much fun! My favorite part was all the dancing, all my favorite songs played! The time went by so quickly, I wish it could’ve lasted longer. On August 2nd, National night out or night to unite was in full effect as my royal girls and I went from house to house conversing and sharing snacks with everyone present. It was an amazing way to get the community together and be able to meet so many people from the community that we may not have met before and reconnect with people that we did know, like my first grade teacher! This was also a time fire the policemen and firefighters to come out and give everyone information about different situations and what to do if it happens. 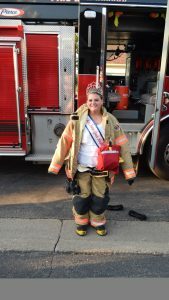 We even got to try on a fireman’s uniform, it was so heavy! I am so very glad I got to be apart of night to unite because it has taught me more about my community and I was able to learn more about national night out! 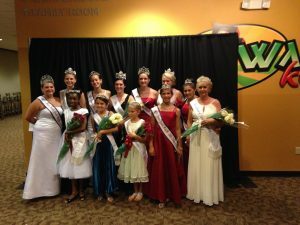 My court and I went to the Rice Street Coronation. It was a blast getting to mingle with all the candidates and eating some yummy food! Their opening of the coronation was so cool; the current royalty were tour guides and the candidates acted as tourists going through Rice Street. It was so funny! 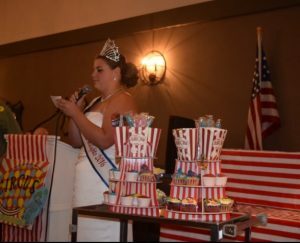 After that was the awards and crowning. It was sad to see the current royalty go because they were so kind all their reign but, it was nice to see the new court. The judges must have had a hard time choosing three out of the seven candidates because all of them were such wonderful nice people. When we were done with the pictures we went to get cake but there was none left! Well next time I say we go to the cake first then get pictures! 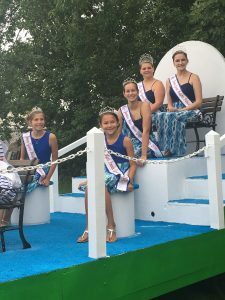 Saturday, July 30th, my royal sisters and I participated in the Rosemount Leprechaun Days parade. The day was special to me because my dad pulled the float and my little brother came to help with the float set-up and ride along. 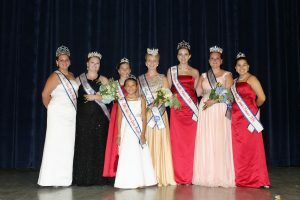 My court visited with other royalty from Winter Carnival, Eagan, Oakdale, and Farmington. The parade route was packed with families and the crowd was at least ten people deep! It was a warm summer day. We were happy to have sunny skies above to celebrate the day.